Gathering Place. Your family will enjoy the realistic fire of Liberty. Nobody will know that your fireplace is a convenient direct-vent gas unit. Your heating needs are met at the flick of a switch with the efficient, clean heat of Liberty. Included in every Liberty is a battery back up system that will allow safe operation of you fireplace during a power outage. 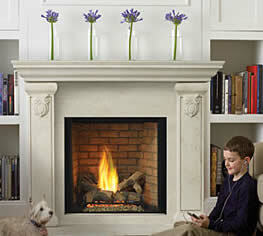 Your home – your fireplace.